Murder Of Rizzio by John Opie. Guildhall Art Gallery. 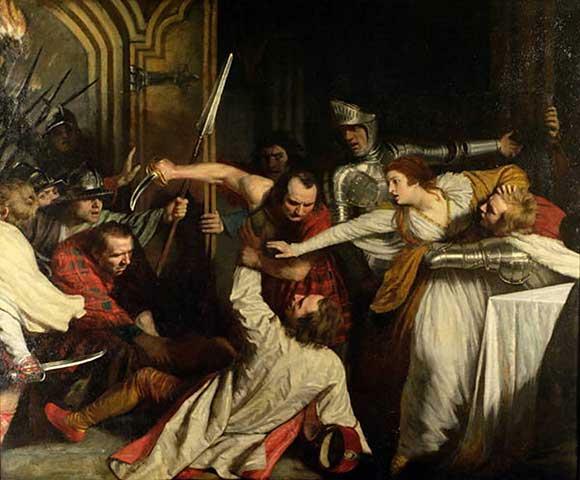 On March 9, 1566, the Palace of Holyroodhouse bore witness to a gruesome murder. At the time, the castle was home to Mary Queen of Scots, the reigning monarch of Scotland. Queen Mary was relatively new to the country, having moved from France in 1561 following the death of her husband, King Francis II. Because of this, she was unprepared for Scotland’s volatile political climate and the ruthless plotting of those who wished to wrest power from her. Even her own royal entourage was not without its schemers, including David Rizzio, Queen Mary’s private secretary. It was well-known that Rizzio was close to the queen (perhaps too close) and friendly to bribes. She regularly took his advice to heart, and at his suggestion, she married Lord Darnley in 1565. Unfortunately, it turned out to be a horrible match. Darnley constantly pushed for more power and spent most of his evenings at local bars and brothels with disreputable friends. As Queen Mary turned to her inner circle for comfort and support, suspicion began to grow about the nature of her relationship with Rizzio. When she announced her pregnancy a few months after the marriage, many questioned who the actual father of her child was. Darnley was enraged by rumors of her infidelity, so much so that on the evening of March 9, 1566, he gathered a group of armed nobles for an attack. They burst into Queen Mary’s chambers, held a gun to her pregnant belly, dragged Rizzio from the room and stabbed him 56 times. We went, in the deep twilight, to the Palace of Holyrood, where Queen Mary lived and loved. There’s a little room to be seen there, with a winding staircase leading up to it. This the murderers ascended, and finding Rizzio, drew him out. Three chambers away is a small corner where they killed him. Everything around is broken and moldering, and the bright sky shines in. I believe I found today…the beginning of my Scottish Symphony.